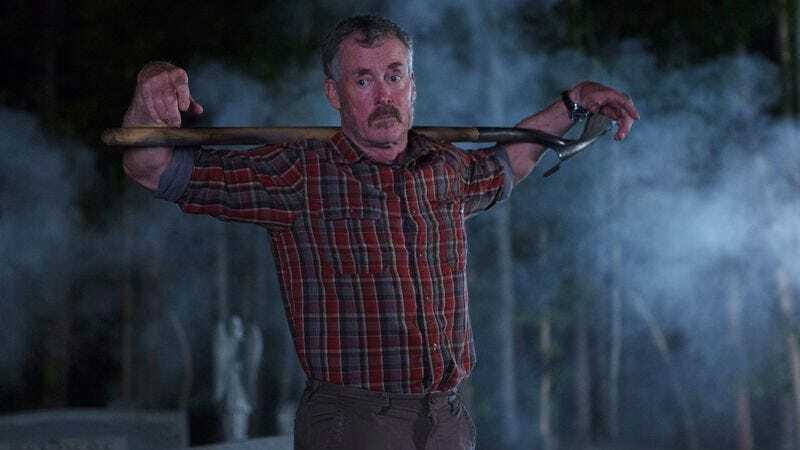 "Dig Me Up Dig Me Down"
IFC is premiering its new supernatural horror comedy series Stan Against Evil tonight before moving it to its normal Wednesday slot. As far as Halloween treats go, it’s a smart move, a bite-sized introduction for those likely to appreciate its low-rent but enjoyable mix of gloopy horrors, drollery, and John C. McGinley’s signature, hyper-verbal assholery. Created by noted comic and former Simpsons writer Dana Gould, Stan Vs. Evil is unabashedly derivative, with horror-comedy fan Gould tossing out references all over the place to the likes of the Evil Dead movies, Drag Me To Hell, Buffy The Vampire Slayer, The Simpsons’ “Treehouse Of Horror” episodes, An American Werewolf In London, and more. Nowhere is the Sam Raimi influence more apparent (not to say shameless) than in its protagonist, McGinley’s disgraced former Sheriff Stanley Miller. Sporting a perpetual five-day growth around his cop mustache, a hoarse growl, and a wardrobe of rumpled L.L. Bean casual wear, Stan is the show’s analogue for the Evil Dead franchise’s Ash, a boorishly overconfident everyman whose wise-cracking contempt for the supernatural horrors he’s suddenly immersed in serves to ground the increasingly gory action. Indeed, Stan Against Evil hews so closely in concept to Bruce Campbell’s current TV revival of Ash that it often comes off more as a mere riff on the Raimi originals than something uniquely its own. For one thing, the show’s central conceit—the New Hampshire town of Willard’s Mill has a serious witch problem, dating back to the 172 suspected witches burned by the town’s 17th century constable—means McGinley’s up against some very familiar-looking demonic foes. The witches of Willard’s Mill not only look and sound an awful lot like an unholy union between Ash Vs. Evil Dead’s Deadites and the witchy antagonist of Raimi’s Drag Me To Hell (black bile barf and all), but there’s even a Necronomicon-style magic book that’s the key both to calling the decrepit baddies up and to banishing them messily back to hell. Luckily, the pilot takes all this liberal cribbing as a given, and just steamrolls right into the fun. And there’s a good deal of fun to be found in Stan Against Evil, its no-nonsense first installment whizzing right through the necessary scene- and character-setting. Deadpan newspaper headline montages help set up Willard’s Mill’s bloody past and matter-of-fact approach to the horrors of its daily reality. The headline “Anniversary of witch trials brings mysterious screams, pie contest,” greets the town’s new sheriff Evie Barret (You’re The Worst and Burning Love’s Janet Varney), and her weird new deputy Leon fills her in from there with similarly prosaic and chipper portents of doom. “You’re as good as dead,” pronounces the ever-grinning Leon (It’s Always Sunny In Philadelphia’s Ryan McPoyle, Nate Mooney), before letting his newly arrived boss know that every sheriff in Willard’s Mill’s history has died a horrible death soon after taking the office. “Deputy’s really the job to have around here,” boasts Leon, without malice. That scene, repeated at the episode’s bloody denouement, gives you most of what you need to know about McGinley’s protagonist. When the show’s initial witch baddie rears up behind him, Stan’s “Geez lady, anybody ever tell ya’ you look like a barrel of assholes?” similarly lets McGinley set the tone, both for Stan and Stan Against Evil. Despite a sparse but promising cast of supporting players, this is McGinley’s showcase, a not-unpromising prospect for anyone still missing his turn as secretly-soulful, motor-mouthed alpha male Perry Cox on Scrubs. Like there, his Stan is enormously pleased with himself, a hyper-verbal jerk whose utter contempt for those who aren’t on his imagined level sees him doling out elaborately abusive insults, at least partly to fill the time until those around him can catch up. The show, co-produced by McGinley, is the star’s vehicle to drive, and while, as ever, what McGinley does could rightly be called self-indulgent or hammy, it’s also pretty damned enjoyable. Varney’s Evie is a fine match for him here, too, her sensible professionalism not preventing her from adapting to the dark ridiculousness of her new gig with aplomb, even as Varney gives her “exasperated but willing to listen” face a workout. Stan—ditched from his job after a witch-provoked freakout at his wife’s funeral—is a gruff, sexist, racist, homophobic jackass, but Varney’s Evie matches him simply by waiting him out, and then being good at the job. When Stan, introduced coming out of the police station shower (he’s been living there since his wife died), launches into a sexist rant (“That’s what women do. You ask them a question and they answer your question with a question. But do they ever answer your question? No. Because that would be a sign of weakness”) Evie—clearly no stranger to this sort of thing—just lets Stan run out of gas before gently asking him if he’s been home since the funeral. “Not so much, no…,” trails off Stan, allowing McGinley to immediately introduce an affecting depth of grief to Stan’s macho bluster. That’s something McGinley excels at, as a rule, and while Stan Against Evil is clearly here to let McGinley do his thing (we get his trademark angry neck-crack and impatient tooth-whistle in the first episode), the actor has lovely little moments here and there that make Stan more than just a reactionary quip-machine. Finally returning to his empty house, he lingers momentarily over the ”his and hers” keyring holder at the door, and responds to a noise upstairs with a reflexively hopeful “Hello?” before silently registering reality once more. The ability to strike notes of soulfulness in between alpha-male rants works to make Stan an appealing enough figure, especially once we discover along with him that his wife’s private sanctum sewing room was actually a medieval-weapon-festooned witch hunter’s lair, and that Stan only survived 28 years on the job because she was basically the town’s secret Buffy. Still, this is McGinley’s show, a prospect promising enough in theory and practice here to eclipse some of the series’ shortcomings. The show’s meager budget keeps the action hemmed in to its few locations. (With 172 witches lurking out there somewhere, it seems like every citizen of Willard’s Mill can have their own personal witch by the look of things.) The effects for the witches (who love popping up for jump scares) are familiarly latex-looking or CGI cheap, an economic necessity that’s either endearingly part of the joke or tossed-off, depending. And it has yet to be seen from the premiere’s abrupt 22 minutes if Stan Against Evil will be able to mine its irreverent take on the horror genre for more than the choppy pleasures (in more ways than one) it provides here. Still, the cast is game, and, if you’re looking for a knockoff Bruce Campbell this Halloween season, you could do a lot worse than John C. McGinley. It has yet to be seen whether Leon’s the bumbling sidekick Stan pegs him as (Leon seems to have gotten the job through some nepotism), but, in his one scene, Mooney lends the deputy a promisingly eccentric indifference to his bosses’ fates. His ever-grinning, gap-toothed bluntness suggests a Dave Foley character from Kids In The Hall. 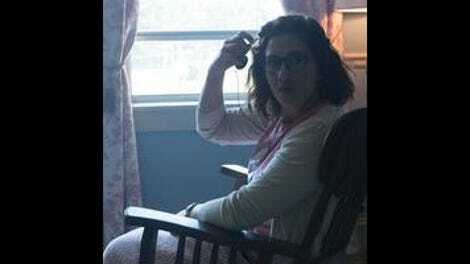 Like this year’s The Witch, and WGN’s Salem, Stan Against Evil posits that that whole New England witch hysteria wasn’t so much hysteria as good public policy. It remains to be seen if the series delves into its mythology on anything more than a “Witches are real—burn them!” level. Evie’s a single mother so, naturally, her adorable young daughter is immediately kidnapped by a witch. Still, Varney makes Evie’s desire to do both jobs look formidable, as she tries to match McGinley’s tough guy plan of action while conceding that she just has to let her ill-fated sitter know she’ll be late. Gould’s “Treehouse Of Horror” love shows most in the episode (and series) titles. Hope you like puns.